It's astonishing, still. In 2017, I didn't quite believe Forbes's valuation of the Brooklyn Nets at $1.8 billion, the 7th most valuable team in the NBA, up from $1.7 billion in 2016 and $1.5 billion in 2015, especially since that somehow included the Barclays Center. 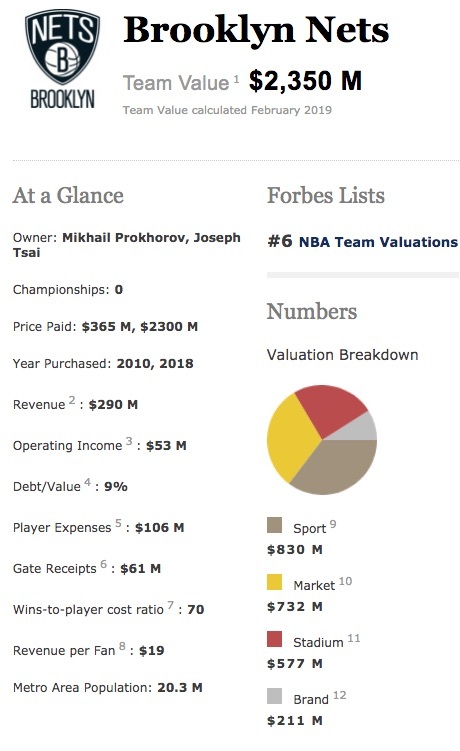 But yes, Forbes was right in 2018 to value the Nets at $2.3 billion, sixth in the league, because that was the valuation set in the deal by Mikhail Prokhorov to sell the team--first 49%, the rest, an option to be exercised in 2012--to billionaire Joe Tsai. For 2019, Forbes (Kurt Badenhausen and Mike Ozanian) values the Nets at $2.35 billion, a tiny uptick. They're still sixth in the league. Operating income has risen slightly as well, from $52 million to $53 million, which, relatively speaking, is great news, since the Nets for years lost money. But there's a paradox on Forbes's NBA valuations list: eight teams worth less earn more income, sometimes much more. For example, the Houston Rockets, worth $2.3 billion, had $103 million in operating income. Moreover, the Nets are second to last in the league in revenue per fan, which suggests that they have a ways to go. 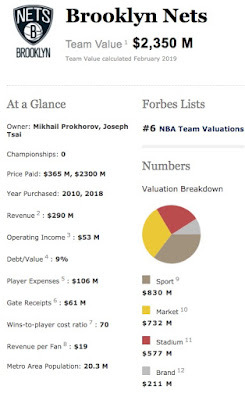 Forbes: "Our estimated income statements and franchise values include revenue team owners get from non-NBA events at their arena." Note that the "stadium"--the available venue--is said to have contributed $577 million to the overall value of the team, presumably part of the valuation Tsai is assumed to have made. The Forbes article notes that "soaring local media deals, new arenas and basketball’s international popularity continue to push the value of NBA franchises higher." The Nets' new local TV deal is worth double the previous one, according to Forbes. All teams share in a $24 billion (!) TV contract with TNT and ESPN. Now there are even logo patch sponsorships. In the future, sports gambling could also generate revenues. Beyond that, the Nets actually have a solid product on the court, after a patient and savvy rebuilding, without the albatross of inflated player contracts. That means they could both draw more fans and also reap some playoff revenue. That adds up to $68 million in operating losses, but not all attributable to primary owner Mikhail Prokhorov, as I explain below. Forbes says Prokhorov paid $365 million for 80% of the team and 45% of Barclays Center operating rights in 2010. Another way to frame it: he agreed to pay $200 million in cash, and assume 80 percent of the team's $207 million debt, or $165.6 million, but he also agreed to absorb up to $60 million in losses before the Brooklyn move. Still, let's keep the total cost at $365.6 million; we shouldn't automatically add $60 million and call it $425.6 million because we're adding up the losses separately. In 2015, when Forest City Enterprises wanted to get out of the team/arena business and had no one else to sell to, Prokhorov paid $285 million for the remainder. The transaction, which valued both the arena and team at $1.7 billion, now seems to be a huge bargain. So that's a total of $650.6 million, plus operating losses. Prokhorov both gained and lost less; his combined losses are $66.97 million. Add that to his costs for the team, and the total is $717.57 million spent, in exchange for an expected payment of $2.3 billion. That's quite a return. Remember, Prokhorov, no stranger to bluster, in March 2010 told the Times the Nets’ value should reach $1 billion once the new arena “is built and the team gets to the top of the NBA. He did far better. The Nets never made it to the top of the NBA, but the value hit $1.5 billion in 2015, according to Forbes, a huge leap. Part of it was a perceived doubling of the "stadium" value to the team, from $257 million to $512 million, well after the Barclays Center began operations. The same venue is now said to contribute $577 million of value. Do note: Prokhorov has not made much, if any, money on the arena. Indeed, as Forbes noted, though the sale to Tsai did not include arena operating rights, the Nets gain additional revenue from a new lease. But the huge valuation of the team surely makes up for that.